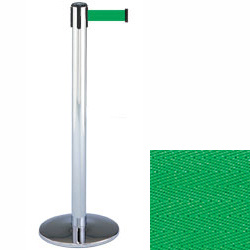 This chrome stanchion with green belt is 7.5' long with 2" wide belting. 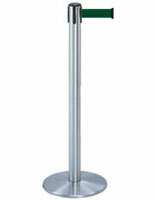 These eye-catching crowd control barriers are retractable, which makes for neat transport and storage. This retractable stanchion with green belt reaches 38" tall and weighs just 24 lbs. The sturdy round base is weighted, with a 13.5" diameter. 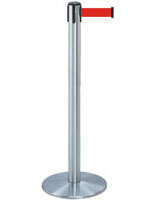 This stanchion with green belt and chrome posts hails from our Tensabarrier collection, an industry leader for decades. 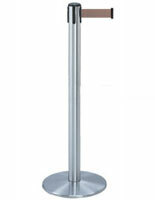 For high-traffic areas, we recommend using Dual Belt Posts. 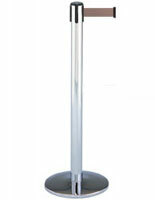 People (especially children) will be discouraged by these crowd barriers from ducking underneath, due to the design. For assistance with layout options, click designing crowd control systems.